Being a game about memories, it almost felt natural when we drew references to several familiar and distinctive titles during its unveiling. Shouldn't be bad at all either. Capcom's Remember Me is a futuristic action-puzzle-adventure game being made by the Parisian studio Dontnod, a move that corroborates the gradual westernization of the Osaka brand. It follows current trend of cyber-near-future universes, but with some twists on art direction and gameplay design: that's where you can identify the French refinement and the crazy Japanese style. Let's see where it could be feeding from and where it will recall it's own personality. 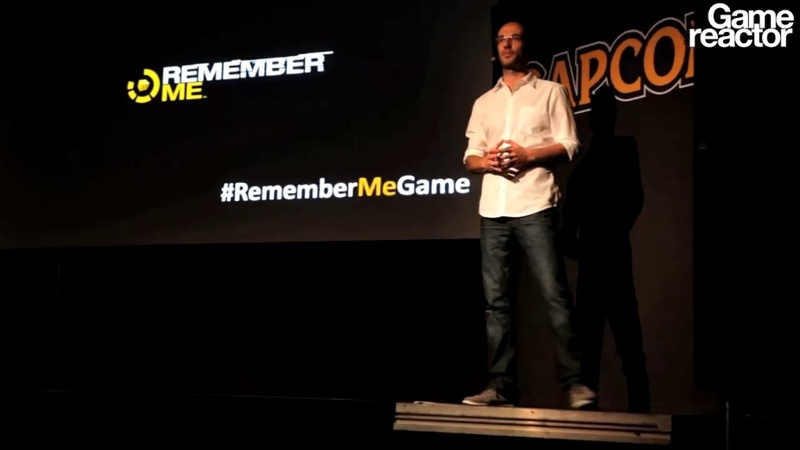 Opening minutes of the live gameplay demonstration caused the first clear comparision: "looks like Capcom wants its own Uncharted". Completely cinematic platforming sections, scripted events such as explosions and falling ledges, pursuing shooting chopper... everything looked like Drake's adventures, if it wasn't for the surroundings, the technology and the female protagonist. Oh, and also for the early animation work, still miles away from Nathan actor-like gestures. Nilin, young, brave, blank memory, is the main character. Boxart and pose might ignite some P.N.03 memories, but she's more serious and direct. She doesn't dance, she's not trying to hypnotize you: she survives, attacks and hacks. She's effective and practical. She used to be a memory hunter (accessing people's brain-implanted chips, then remixing and changing stuff at her will), but now it's her mind which has been wiped. Only memory left is that unique remixing ability (no other hacker can perfom it), so with that, and the help of Edge, leader of an activist organization, she should recover her lost past. 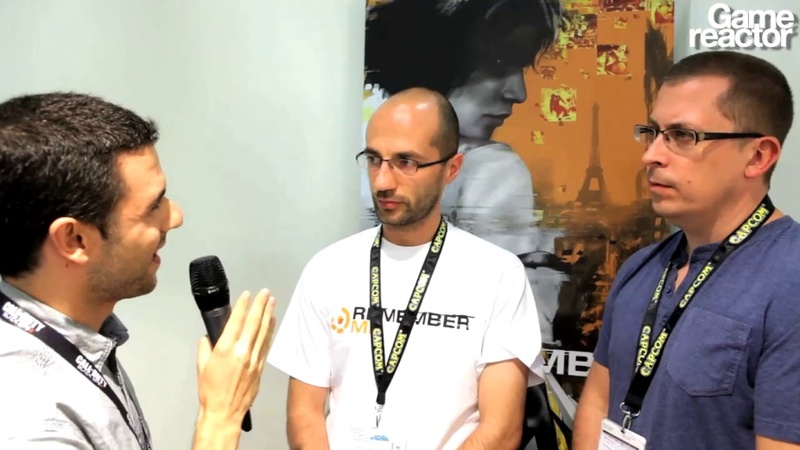 "Some people say amnesia is a fairly common thing in videogames and it's true, but being the theme of the game, memories and how intimate they can be and what can happen if we change them, it made total sense", justifies Jean-Maxime Moris, Game Director, during the post-unveil interview with Gamereactor. The Fifth Element: that's another comparison that came up when looking at the city, if a future some years earlier. HD, intrusive, huge billboards. Corporations' controlling everything. Open areas with secrets, clean corridors versus dirty hidden alleys... Deus Ex anyone? - but this one's not that yellow. Anyhow, "the game mood will expand from early dawn to the night time, from sunny weather to rainy weather. The idea was to give a lot of contrast to the game", confirms Dontnot. It's Neo-Paris, 2084, so it's also way more advanced than, say, Black Ops II's 2025. Combat shields are now light hologram-like panels, which Nilin can activate to protect herself. Indeed, when Nilin was not running or jumping, games like Batman: Arkham City came to mind. Combat will require good pace, focus on the correct enemy of the attacking group. But it's her mind-hacking ability, when used during fights, what really should add some sauce to the mechanic. Syndicate-style (and that's another game, mind you), Nilin quickly hacks machines and brains, making someone's head overheat, making pilots forget their training (and making you try to forget her generic one-liners), or even making a lucid man kill himself. But for that, another cool, slower and surprising process is required. It's when Remember Me becomes a puzzle. It kind of turns into the brilliant Ghost Trick, but with a 3D presentation (need another reference? TRON might do the work). Whilst Nilin will face other memory hunters, "there's one super-power that only Nilin possesses in the game world". The Memory Remix sequences open up the real 'folders & files' structure of the hacked brain, offering complete access to what builds up a person's behaviour. So you can enter, change, leave and then watch the consequences of the new thought, on the modified personality. "You are the puppeteer. you have full control: you can rewind and forward the scene as many times as you want using the left stick. As a memory hunter, you're first looking for the memory glitches - these little cracks you're going to be able to use to solve the riddle. There are many combinations, some of theme are funny (for example if you kill the person [during the memory hacking process] you cannot get out, because you can't remember when you're dead", explains Moris to us when asked about the concept. In the demo, Nilin enters the head of Frank Forlan, a rival commander. The idea is to make him shot himself in the head, so why not making him feel irrationally gilty? Inside of a memory, you can stop time, play with objects or lights and in general change the scene, so the character believes what you want him or her to remember. Mess around with the scene: that recent argument between Forlan and his girlfriend may get worse due to your adjustments... and maybe you'll build up that gilty feeling eventually (note: it's much easier if gun's safety is off) - check out game presentation video for a clear example. Same as with Ghost Trick, it doesn't look like a trial and error process you can repeat again and again without any penalty. We'll see how the game rewards players who get everything right at first attempt. After all this you could still think about Watch Dogs, or even Mirror's Edge. Maybe films like The Matrix, Blade Runner, AI or Minority Report. So Nilin's work, aside from recalling its own life, is making this a game that fits on the current futuristic-hacking trend, but one that stands out by its own merits, not a "me-too" title that wants to confusingly be there for the sake of that trend. For Capcom, announcing a completely new production like this is "a risk" these days. And we of course applaud that. For attenddes to their Gamescom conference last Tuesday, it was a fresh surprise and definitely one of the things of the show to remember. Don't forget it'll be out next May. "Now imagine cherry-picking your own personal favorite memory, and sharing it with the person next to you. In fact, what if we could all have access to all the memories of all the people sitting in this room. Or better yet: imagine if we could all buy, sell, share or trade any memory in the world (...) Or what if we could delete our painful memories". Prox1mately on the 19th of August 2012 at 20:29. Interesting to say the least. I'm hoping this becomes a Vita title.